One of the things the lovely yet formidable Marcia loves most about me is how I’m always generously sharing fascinating news articles with her regardless of what she’s doing at the time. “I’m trying to get some work done here,” she said, hunching over her laptop. “If you say so,” she said, turning back to her laptop with what I swear was a slight grin on her face. I have half a mind to stop reading her fascinating articles. But she failed to mention how cute and clever you both are, and if Tonka can write, you have a goldmine. If Tonka could write, marcia would have no use for me. Dogs make life so much better. We are blessed to have them in our lives. Over the years I have been Dad to 11 dogs. They have all been intelligent, energetic and inspiring. Life without dogs would be so much less adventurous. Cleaning up after their poops is a tiny price to pay for what we get in return. I pictured “Tonka” to be a large sleek chocolate-colored Lab like the one at the top of the article. Then I saw the picture of Tonka Heller! Adorable! No actual resemblance–but personality and manners sound very close! My dogs drive me absolutely bonkers! They think they have to go outside & come in every 5 minutes, they bark at every noise they hear and they think that dog food isn’t good enough for them (yes, I cook for my dogs)! Aside from all of that, they make a big deal when we come home from work, or from anywhere, they are good listener’s when you have a bad day, they give great hugs and they provide unconditional love! They are my boys, my babies! Thanks for the laugh! 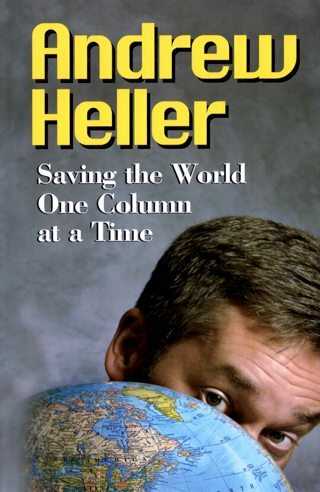 Classic Heller column. My father was my dog. Same sense of humor, same view of the world. Even though we use to bark at each other and wrassle sometimes. RIP Ralph 1926 – 1986! If I were you, I would be very concerned about that “slight grin on her face”. Check those lower parts every morning thoroughly when you wake up . . . . if you wake up! I agree with the similarities of dogs & their owners. Our 10ish rescue Cocker is pretty much a sleeper, rest a lot just like his “father”. They go to bed between 9 &9:30. J J, the dog gets up 7:30 8ish with me. I am allowed to feed him his meal which consists of approx half can of special dog food. At a cost of $120.00 per month from Amazon. He also loves riding in the car, when the ride ends if he thinks it is not long enough he refuses to get out. More another time about the Beatle pup who also lives here with our son. Politics, anyone? Lead into next week maybe? We need to go along with Mr. Mueller exoneration of Mr. Trump. Best-respected investigator, greatest investigative team. 1. It still is true that the Russians did a heck of a job influencing our election to Trump’s advantage. 2. Trump still is a low-down rattlesnake. I had to wait until someone with Trump Derangement Symptom to comment on the Mueller “investigation” before I would make a comment or two. The report was released on Friday after 5:00 p.m. That is the usual time that any announcement coming out of Washington D.C. is released when the information is not a good report. If Mueller had any information that implicated President Trump with “collusion and obstruction” during his investigation, it would have been released earlier in the day. Mueller dutifully turned the report over to Mr.Barr like he is required to by law. He cannot turn over to anybody else. Mr. Barr read the 400 page plus report and then issued a 4 page letter on what it said. NO collusion and NO probable cause for obstruction. Mr. Mueller was hired by R. Robinstein to conduct the investigation. Not by President Trump. Yes rumors floated around that President Trump might of considered firing Mr. Mueller, but he did not. After all they were rumors. From listening to various news agencies Democrats are slightly upset with the report. There are a couple of democrats who want to have some more investigations, this time of Mr. Mueller. Probably to ask him why he did not find anything to charge President Trump with. Yes, some of the people that worked for President Trump here in America were indicted for tax fraud and other things. These charges were for events at least 10 years or so before they were employed by President Trump started running for office. Not for anything they did while on his campaign. Let me state this fact again, The Russians did not influence my vote and the vote of others that voted for President Trump. It was the democratic candidate that influenced to vote for President Trump. In fact listening to the current list of democrats attempting to run for the office of POTUS none have any ideas or solutions to make me want to vote for any democrat candidate.